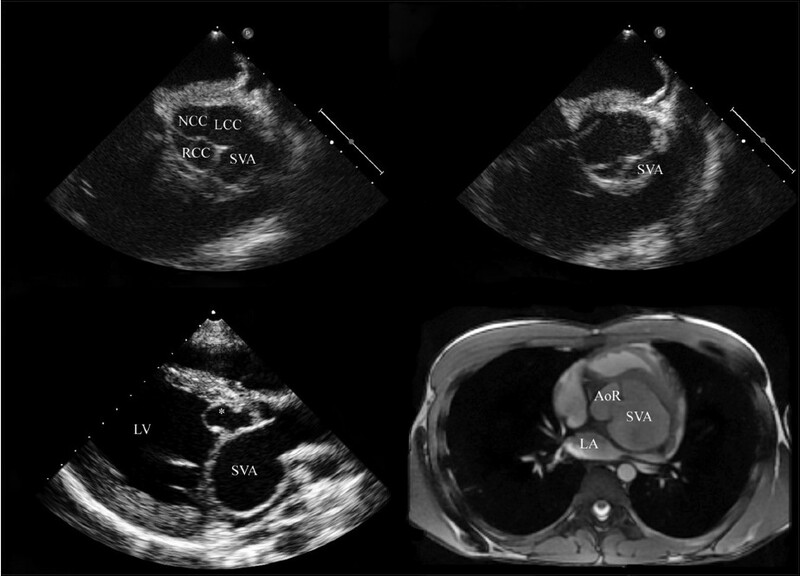 A 14-year-old male presented with an acute inferoposterolateral ST-segment elevation myocardial infarct. A week before he had developed exercise-induced angina, which progressed to recurrent episodes of chest discomfort at rest during the days before presentation. He had no previous medical history nor used illicit drugs. Diagnostic coronary angiography revealed extensive thrombus in the mid-segment of the left circumflex, which could not be aspirated with an export catheter [Figure 1]a. A bare metal stent was inserted, and TIMI 3 flow with a normal blush index was established [Figure 1]b. Transthoracic echocardiographic assessment revealed a large structure bulging in the left ventricle, displacing the anterior mitral valve leaflet into the left atrium, and resulting in mild mitral valve obstruction and regurgitation [Figure 2]a-c. Additional transesophageal evaluation confirmed the presence of a large left-side sinus of Valsalva aneurysm (SVA), without evidence of intracardiac or intracavitary thrombus [Figure 2]a and b. Additional evaluation with 64-slice multidetector computed tomography [Figure 3] and gadolinium cardiovascular magnetic resonance was helpful in delineating the size and position of the aneurysm as well as the extent of his myocardial necrosis [Figure 2]d. Elective repair was scheduled, but 3 weeks later he however presented in congestive heart failure after rupture of a smaller second aneurysm, originating from the primary sac [Figure 2]c. During emergency repair, the orifice of the aneurysm was closed with pericardial patch. Obliteration of the aneurysm, which had gradually displaced the anterior mitral leaflet, resulted in severe mitral valve regurgitation requiring replacement with a prosthetic valve. Six months after his surgery he remains well, and has engaged in noncompetitive, noncontact sports. Left-side SVA is rare, representing 1% of SVA's, and are most commonly congenital in nature, resulting from the absence of muscular and elastic layers. Clinical presentation is usually due to rupture and resulting heart failure, but several cases of effort-related angina, myocardial infarction, and cardiac death secondary to compression of the left main stem, the left anterior descending, and/or left circumflex have been reported. ,,, Successful repair of the aneurysm, in some instances with coronary bypass grafting or aortic valve replacement because of aortic valve regurgitation, has been performed. ,, Our patient is the youngest reported to be managed for myocardial infarction due to left-side SVA, the first reported to be managed with coronary stenting, and the first to require additional mitral valve replacement. Six months after his surgery he remains well, and has engaged in non-competitive, non-contact sports. 1. Lijoi A, Parodi E, Passerone GC, Scarano F, Caruso D, Iannetti MV. Unruptured aneurysm of the left sinus of Valsalva causingcoronary insufficiency. Case report and review of the literature. Tex Heart Inst J 2002;29:40-4. 2. Bashour TT, Chen F, Yap A, Mason DT, Baladi N. Fatal myocardial ischemia caused by compression of the left coronary system by a large left sinus of Valsalva aneurysm. Am Heart J 1996;132:1050-2. 3. Shin JK, Jung JP, Park CR, Lee SG, Shin ES, Kim SJ. Acute myocardial infarction due to unruptured aneurysm of left sinus of Valsalva with aortic valve regurgitation. J Card Surg 2005;20:545-8. 4. Ramirez-Marrero MA, Alonso Briales JH, Lopez-Rincon F. Resuscitated sudden cardiac death caused by left main coronary artery compression by an aneurysm of the sinus of Valsalva. Eur Heart J 2007;28:2959.